Are you moving soon and need to move your mattress from point A to point B, but don’t want to hire a mover? 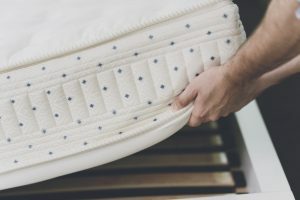 To ensure your mattress gets to your new home safe and undamaged, it’s important to be prepared, especially since mattresses don’t fit into most cars. If you don’t have access to a truck that is big enough to transport your mattress to your new place (and you don’t want to rent one! ), your best option is to move your mattress by utilizing the roof of your car. As long as your mattress is proportionate to the size of your car (it’s probably not the best idea to move a king size mattress on a Volkswagen Beetle! ), you shouldn’t experience any issues. Using a mattress bag or plastic sized up to the size of your mattress will help protect your mattress from the elements during your move. Be sure to tape down any of the extra plastic to avoid it acting as a sail. This can be very dangerous and can cause your mattress to come loose. You’re going to need rope to tie down your mattress both width-wise and length-wise. Keep in mind the size of your mattress and the extra length you’ll need to tie the rope to your car. Place your mattress in the center of your roof and tie your mattress down length-wise first. There should be enough rope to tie it down under the front end of your car as well as the back end with taut. Next, open all of the windows (except the driver’s side window) so you can fasten your mattress width-wise. Loop the rope through the backseat windows twice before tying the two ends together. Keep in mind by tying rope through the back windows will keep your doors from opening. The closed driver’s side window will ensure the car’s passengers can get out in case of an emergency. Transporting a mattress on your roof can block your view so be sure to drive carefully and slowly! If you can stay on backroads, that’s even better. If you have friends available, have them drive behind you so if there is any slippage of the mattress you can pull over to readjust before it’s too late. If moving your mattress yourself sounds overwhelming, let All Day Moving help! Give us a call today at (978) 682-2040 to schedule your move.